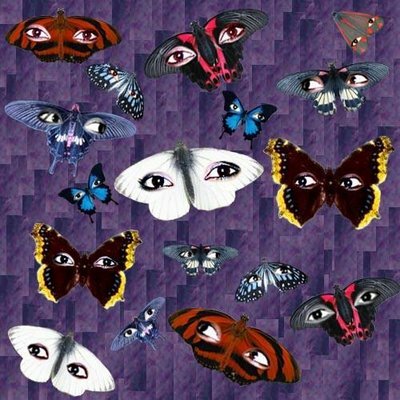 When I look into your eyes, I get butterflies in my stomach. I saw a girl exhausted from studying, whose hair had fallen in front of her face like a theater curtain. And still, her eyes broke through her tresses as if two full moons of some undiscovered planet shone through the twilight sky. Can a group's cognitive profile predict what type of music its members will excel at? Broadly, looking at just two aspects of cognitive abilities and two aspects of music: probably. Narrowly, focusing on subtle differences: probably not. 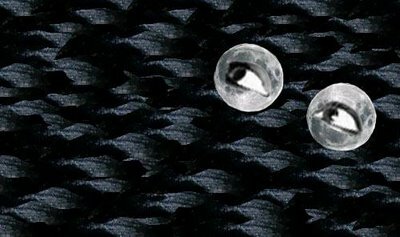 Still, that a rough prediction is possible at all is news and suggests that the two central aspects of music may be parasitic off of more fundamental cognitive abilities rather than forming an independent music module, though of course music requires unique skills like sensitivity to pitch. First, I'm discussing music composition -- not performance or criticism. The two central features of music I examined were were melody (roughly, how a "voice" develops through time) and harmony (roughly, how separate melodic voices interact with each other or how they're stacked on top of each other at any given moment). These are thus often referred to as the "horizontal" and "vertical" aspects of music, respectively. The two central features of cognitive ability I examined are the verbal and spatial "shadows" of g (different particular shapes cast by a single general factor), as measured by standard IQ tests. I noticed a similarity between melody and verbal skills, which deal with mostly serial processes, and between harmony and spatial skills, which deal with more parallel or simultaneous processes. In fact, I'd been scooped on noticing that: in Steven Pinker's explication of evolutionary psychology, How the Mind Works, he argues that music is largely not an adaptation but a pleasurable co-opting of more basic adaptations such as speech processing (melody) and visual scene analysis (harmony). However, Pinker wrote HTMW years before he took psychometrics seriously, so he missed out on a good empirical test for his hypothesis -- that is, do populations whose cognitive profile favors verbal compose music that is driven more by melody than harmony, conversely for those whose profile favors spatial, while balanced groups compose music equally driven by melody and harmony? Good guess -- that's what I thought before I looked at any data -- but it seems that cognitive profiles are more necessary than sufficient conditions for developing a certain style of music. First, a couple of graphs to help visualize what the hypotheses are. The first shows spatial IQ plotted against verbal IQ, while the second shows emphasis on harmony plotted against emphasis on melody. 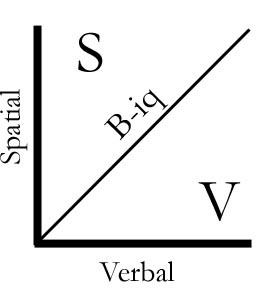 The diagonal line does not represent data points -- it is there to partition the space into three equivalence classes: V, where verbal IQ is greater than spatial IQ, S where spatial IQ is greater than verbal IQ, and the line B-iq where verbal and spatial IQ are balanced. (In reality, B could also be a two-dimensional region, essentially a thick stripe defined as the points on or +/- some small distance from the line B. We treat B as a line for ease of presentation.) 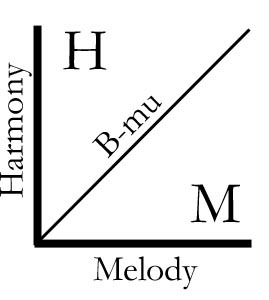 For the music graph, the classes are M where melody is given greater emphasis than harmony, coversely for H, and B-mu where both are balanced (again, simplifying B-mu into a line). Data points on the graphs would represent the population mean for the given traits. The initial guess is that there is a one-to-one correspondence between equivalence classes in the two graphs: i.e., that Verbal and Melody map to each other, as do Spatial and Harmony, and B-iq and B-mu. In reality, it appears that all regions of the IQ plane map to Melody, while Harmony is mapped to only by Spatial and the B-iq line, not by Verbal. We now consider populations whose Verbal:Spatial ratio (V:S) is +/- balanced, lopsided toward verbal, and lopsided toward spatial: respectively, Germans; African-Americans and Ashkenazi Jews; and Arctic peoples. (See here and here for reviews of Richard Lynn's work on the cognitive profiles of the world's populations.) Do the musical styles in which these groups creatively excel reflect V:S? For each group, we've selected a "high" form of music native to the population: for Germans, Baroque music; for African-Americans, Jazz; for Ashkenazi Jews, Klezmer; and for Arctic peoples, throat singing. So, the relationship between cognitive profile and prominence of melody vs harmony is in line with the prediction. Note that Klezmer was developed during the 15th to 19th centuries, and is not found in Sephardi or Mizrahi Jewish groups, suggesting that this musical style followed after the Ashkenazim's change in cognitive profile which favors Verbal but not Spatial skills. Incidentally, we could also have used Jazz for assessing Ashkenazi musical style, since they have contributed many seminal figures in that genre as well. They have also contributed Mendelssohn, Schoenberg, and Mahler to Western classical music, though they are not as well represented here as in Jazz, and the classical figures are less central to the tradition than their Jazz counterparts (e.g., Gershwin or Stan Getz) are to their tradition. On a more popular level, we note that these groups largely dominate the verbally driven hip hop genre -- most of it by African-Americans, but one of the seminal groups is composed of three Ashkenazi Jews (the Beastie Boys), and current sensation Matisyahu is also Ashkenazi. As for the music of the Arctic peoples, throat singing is actually most associated with Central Asia (Tuva in particular), but I could not find studies assessing the cognitive profile of Central Asians. Therefore, the model makes the prediction that a large survey of Central Asians would show their V:S ratio to be lopsided toward spatial. We would also expect this on evolutionary grounds, given that this population underwent recent, strong pressures for superior spatial skills -- namely, during the era of the Central Asian horseback empires where the ability to accurately hit a moving target from hundreds of yards away, while moving oneself by horseback over rough terrain. Plus, lopsidedness toward Spatial is typical of East Asian groups. Also, the only Native American groups (aside from the Eskimo) who have developed the sort of harmony found in Western classical music -- polyphony, or independent voices that interact, rather than variations on a common theme -- are those of the Northwest US and British Columbia. Perhaps not coincidentally, these groups are closest in geographical and genetic proximity to the Eskimo, as compared to other Native American groups' distance from Eskimos. In general, the languages of this region form a family, Na-Dene, which is separate from Eskimo-Aleut and Amerind. Curiously, the Na-Dene and Eskimo-Aleut speakers arrived in the New World much later than the earlier large wave of Amerind speakers, and these later waves originated from the rough region of Mongolia and Siberia. So, it could be that whatever combination of alleles that allow throat singing and polyphony became frequent only after the first wave of New World colonizers left East Asia for the Americas. Lastly, though, there are several data points which call for tempering the bold hypothesis that a certain V:S is a necessary & sufficient condition for a certain kind of music. On the one hand, the world's musical styles that employ harmony come from groups whose V:S is either tilted toward Spatial or more-or-less balanced. At the same time, plenty of groups with this V:S profile have produced no such harmony-based music -- most of Western high music before the discovery of polyphony in France in the late Middle Ages, as well as the rich traditions of China, Japan, and Southeast Asia. At best what is found in these latter areas is heterophony -- variations on a single voice. So, it appears that melody is common to all musical traditions, and no special cognitive profile is needed for it, although lopsidedness toward Verbal seems necessary to develop the emphasis on melody into the electric energy that characterizes Jazz and Klezmer. The ubiquity of melody, assuming it is parasitic off of more basic cognitive structures, may reflect our species' typical use of language for expression. On the other hand, harmony is rare, such that special skills are needed as scaffolding to hoist oneself up; by hypothesis, harmony is parasitic off of spatial skills, making a balanced or Spatial-favoring V:S a necessary -- but not sufficient -- condition for developing a musical style that emphasizes harmony. Season 3 of the fashion design reality show Project Runway begins this Wednesday at 10pm on Bravo. Judging from the trailers, it looks to be just as good as the previous seasons. 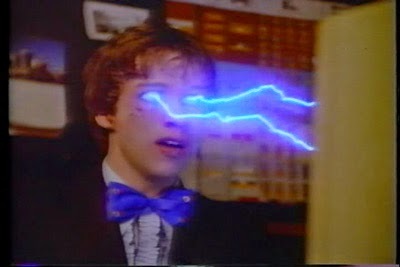 And as one of a tiny handful of reality shows that actually has a threshold of brains to compete, it's good nerd TV. Not long ago, I got curious about the make-up of the fashion design world, and found out that like any other creative field, it was mostly dominated by males of Eurasian descent, not a few of them gay. This likely has nothing to do with irrational discrimination, but rather group differences in cognitive abilities (namely, visuospatial skills) -- and, though I didn't explore it then, personality traits. 1) Roman girls are damn hot. Look no further than Sophia Loren. Curvy, dark, petite (well, Sophia Loren's 5' 8.5"). 2) Their boyfriends were short (compared to Americans) and skinny -- oftentimes downright scrawny. 3) Both they and their boyfriends dressed with style, even if unable to afford the ridiculously expensive stuff. Throughout our week's stay, what I saw only strengthened this initial impression. The girls were also very approachable compared to Americans -- though that could reflect their being used to getting hit on by Italian male strangers at all hours of the day. In any event, I never would've dreamed that there were hot girls who preferred not the Viking warrior physique in their boyfriends but rather that of the adolescent Greek male statue (not even the super-buffed ones). I was convinced I was going to return after graduation (I ended up going to Barcelona instead), so I figured I'd better look the part if I was to stand a chance. In Rome I only bought a pair of those bowling-inspired shoes that everyone had in 2002 but since seem to have vanished. I also ended up finding my comfort zone not in the generic Mediterranean Eurotrash "dirty look," but in a mix between Italian peacockish sensuality and Japanese cerebral sobreity. Ennio Capasa, who founded Costume National, apprenticed under Yohji Yamamoto after graduating from fine arts school, so he tends to be my favorite designer. Back here in the US, showing even minimal put-together-ness immediately raises the red flag in girls' minds that you're gay, not a terribly irrational assumption since we're not as flashy of a culture as the Italians. And even among those who are cool with you dressing so, their interest is piqued only insofar as they view it as an honest signal of high status. As it happens, I'm definitely not high status (I have my ways of getting good stuff, though it requires work), so once such a girl found that out, she'd shoot me a disgusted look much as a guy would if he found out a girl stuffed her bra or something. But someday, I'll run into an Italian girl, or a Spaniard, or a Brazilian, and it will be my foot-in-the-door. And in the meantime, it keeps me looking professional enough so that I'll never be reprimanded for violating the dress code. Plus, deciding what to wear is something that's easy to have some simple fun with before having to be surrounded by jerks on the metro and snots in the library (the kids at work are fine, of course). Spoiler 7/13: So the first to be eliminated was a female businesswoman. In the second episode of the second season, a female lawyer was eliminated. In sum: verbal smarts (the businesswoman had a BA from Stanford & MBA from Harvard) don't count for squat in the world of visuospatial art. Good for persuasive bullshitting, yes; for designing and executing 3-D wearable sculpture, no. Shameless plug for a post I just wrote for GNXP. I figured there were enough posts here neurotically puzzling over the weird world of women. Short and sweet of it: no assortative mating for any personality traits, substantial assortative mating for social / political attitudes (taxes, military, etc. ), and happiness of marriage depends far more on similarity in some personality traits (especially Agreeableness) than on similarity in social attitudes.